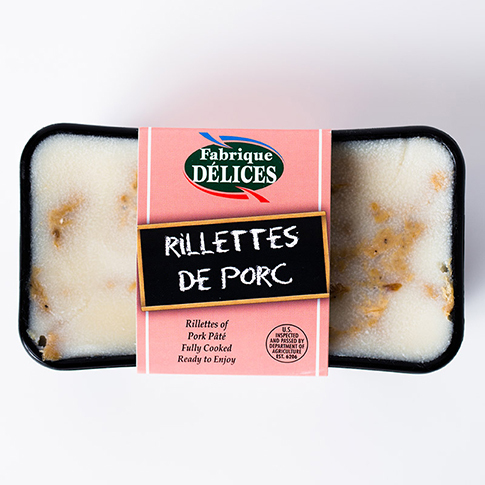 Fabrique Délices - Pork Rillettes - Zuercher & Co.
Born out of a Pâté company called SAPAR out of Meaux, France, Fabrique Délices was created in 1985 to introduce quality French pâtés, mousses and charcuterie to the United States. Today they produce over 3,000 pounds of product per day, while still keeping true to traditional methods and practices. They maintain high quality standards, and do not use artificial ingredients, preservatives, and only use all natural meats from sustainable farms. Among many awards, they are providers of artisanal charcuterie to the White House, Air France, and even the Pope! The shredded pork is all natural, and slowly seasoned and cooked in it’s own fat; creating an intense pork flavor. Try with some spicy whole grain mustard and thinly sliced red onions on a mini toast.